If you were to do a Google search for "chocolate and zucchini" you might be amazed at the number of hits to come up, for recipes, books, and even a food website by that name! This is all because it's a delicious combo, though you can't taste the zucchini at all in this moist and delicious cake. In a medium bowl, combine the flour, cocoa, baking powder, baking soda, salt and cinnamon. Set aside. In a large bowl, beat together the butter and sugar until smooth. Add the eggs, one at a time, beating well. Stir in the vanilla, citrus peel and zucchini. Alternately stir in the dry ingredients and the milk into the zucchini mixture, adding the nuts and chocolate with the last flour addition. Pour the batter into a greased and floured 10-inch bundt pan. Bake at 350 F for 40 to 50 minutes, checking for doneness after 40 minutes by inserting a sharp knife. If it comes out mostly clean, it's done. Run a knife along the edges and let cool thoroughly. Remove to a cake dish and, if you like, drizzle a cocoa glaze over top or to each slice served. Stir all ingredients together until smooth, adding more milk a little at a time to reach the desired consistency. *For an egg-free cake, replace with: 3/4 cup water combined with 1/4 cup ground flax seed (let stand 10 minutes to thicken before adding in the recipe); or 1 cup whipped silken soft tofu; or (if you like a chocolate banana cake) 1 large ripe banana, mashed. 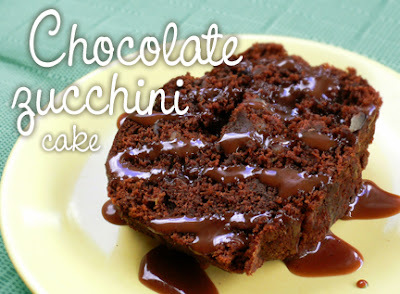 Chocolate Zucchini cake is one of my Mom's favorites. Mine too. Reading through this one, the Almond milk really got me curious. I'm thinking that's going to add a wonderful, subtle complexity to the cake. ok I'll try it. and let you know!! Nice picture. Tongue is getting drenched to see this cake.I will defiantly make it in my home will like to share it with my friends. It says chocolate is not recommended for all doshas. I am Pitta, can you explain this please? Hi Ann, what I mean is that chocolate is not a healthy food for any person of any dosha, so if you have this cake it would be a "treat" knowing that in the end it's best to seriously limit chocolate in your life, depending on how strictly you'd like to follow the Ayurvedic recommendations. That said, if you want to make this cake as dosha-friendly as possible, follow the Pitta substitution recommendations, to make the chocolate part a little less "bad". Hope this helps! Hello Fran! First of all I want to thank you for all your wonderful recipies! Secondly I just wanted to ask if the butter has any special purpose in this recipe? I used cold pressed canola oil instead and it was delicious! Hi Mia! When I first posted this recipe I was still using butter and margarine in my cooking, but it is healthier to use oil! Best oils are light olive oil, followed by sunflower oil, all cold-pressed. For low-fat, half the oil can be replaced with unsweetened applesauce. Glad it worked for you! Hi again! Thank you for the fast reply, I will try to make it with applesauce the next time! I have another question; Do you think you could replace the chocolate and cacao with carob in this recipe?